Using thermal insulation with electric floor heating significantly reduces the heat-up times and running costs. Using Insulation Boards with floor heating significantly reduces the heat-up times and running costs. 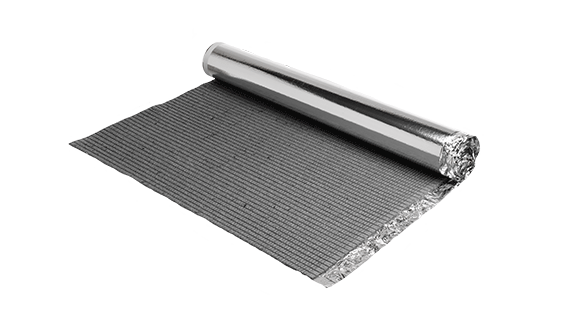 Warmup Insulated Underlay is a thin polystyrene insulation barrier with effective acoustic properties to reduce contact noise. To be used with Foil Heater System. 15 to 20% of total building heat loss is through the floor, thus installing floor insulation can cut down on energy costs, make a home more efficient, and contribute to the longevity of a home. Historically, floors were not insulated under the argument that heat rises, so people should concentrate their energy on preventing heat loss through ceilings and walls which can occur as hot air moves upward through a home. However, heat loss through flooring can still occur when the area under the floor is not climate controlled. Thus, neglecting to insulate a floor can contribute to higher energy bills because heating systems will need to work harder to keep the space warm.. Insulation slows heat losses from a building, either by using bulky, lightweight materials or by using reflective materials to reflect heat back into the building. Insulation is a very significant element in a building’s thermal performance, but it is not the only one. Even if a home is well insulated, heat can still escape through air gaps, windows, gaps in the insulation, and building elements such as framing, as explained in thermal bridges below. A building’s thermal performance depends on all elements of the building working together. Warmup supplies various different types of floor insulation suitable for application with our electric floor heating systems. If you are planning to use a different type of insulation please make sure the main thermal characteristics and compatibility with floor heating remains. Copyright Warmup 2019. All rights reserved.